Structural porch post is made from RDI installs easily with the porch post mounting kit. Porch posts require two Mounting Kits for use as porch post. COMMERCIAL APPLICATIONS ARE ALWAYS BOLTED, USE 3/8" DIAMETER A307 THROUGH BOLTS INTO SOLID WOOD BLOCKING. USE CONCRETE ANCHORS WHEN MOUNTING TO CONCRETE. BLOCKING MUST BE DESIGNED TO WITHSTAND PROPER LOADING. 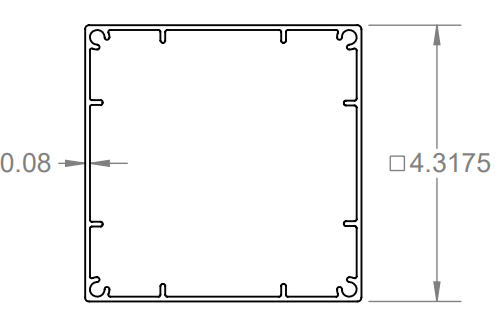 O.D ~ 4-1/2" x 4-1/2"